Rip Off is the latest iPhone app by developer Colorbox. In this simple tapping game, you are in control of a ninja bird intent on saving his unhatched brothers and sisters from a swarm of hungry aliens. 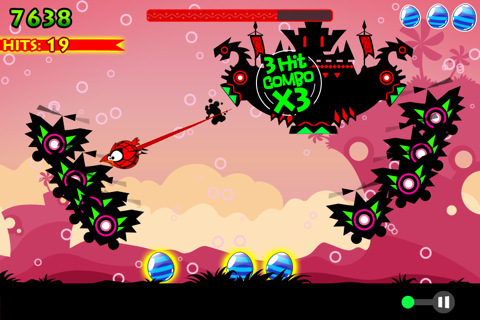 Along the way, you’re also forced to dodge several bombs that will bring a quick end to your game. Colorful graphics and a variety of unlockable perks make playing the game enjoyable, assuming you can survive long enough to achieve them. Overall, the game is fun if not for a few annoyances. Considering it is OpenFeint’s Free Game of the Day, Rip Off is at least worth a download. The game Rip Off revolves around you destroying clusters of aliens before they can make off with the three eggs located on the screen. To kill an alien, you simply tap, and your bird flies through the air destroying everything in its path. The concept will seem like second nature to those who have played Fruit Ninja. Besides keeping your eggs safe, you’re also responsible for avoiding the bouncing bombs that move across the stage at various points. Hitting one of the bombs will end your game immediately. 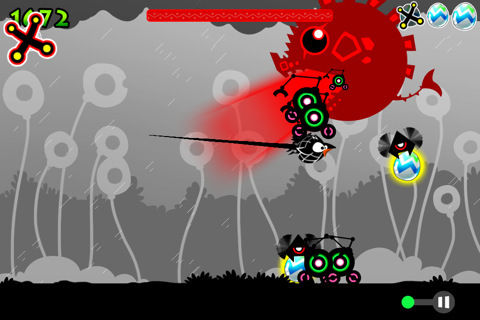 Progressing further through the swarms reveals new, more crafty, enemies trying to steal your unborn siblings. Killing aliens and reaching certain goals will unlock hidden achievements. The achievements give you the ability to play as new characters or use different game backgrounds. Unfortunately, the developers keep the challenges hidden, and you remain clueless as to how soon the next feature will be unlocked. Despite the challenge associated with the game, the fact that only one game mode exists means the concept can become redundant after a few plays. The audio in the game is slightly lacking. A catchy Latin-themed song plays during menus, but no in-game music is available. While in the game, your bird will make sound effects when moving and killing enemies, but there is little diversity. Where the audio lacks, the graphics redeem the game. Your character is in the same vein as Angry Birds, but the aliens in the game are completely original. One of the subtle joys of the game is discovering new types aliens that appear on the screen and seeing what methods they’ll use to take off with your eggs. Overall, this iPhone game is a great value (assuming you get the chance to grab it for free). The concept is fairly original and the controls are simple to use. The audio could have been expanded to include more in-game music or sounds, and the graphics are top-notch. Some people may love the challenge associated with the game, but for many, the lack of variety might not be worth a paid download. AppSafari review of Rip Off was written by Darius Reimm on June 14th, 2011 and categorized under App Store, Fighter, Games. Page viewed 5785 times, 1 so far today. Need help on using these apps? Please read the Help Page. i can’t pass the objective 11 in which i have to kill one boss where i can find the boss? i could not reach the boss (kill one boss ) how can i do kill it or even reach to it ?